I woke up this morning at 630 feeling refreshed and ready to tackle the day. 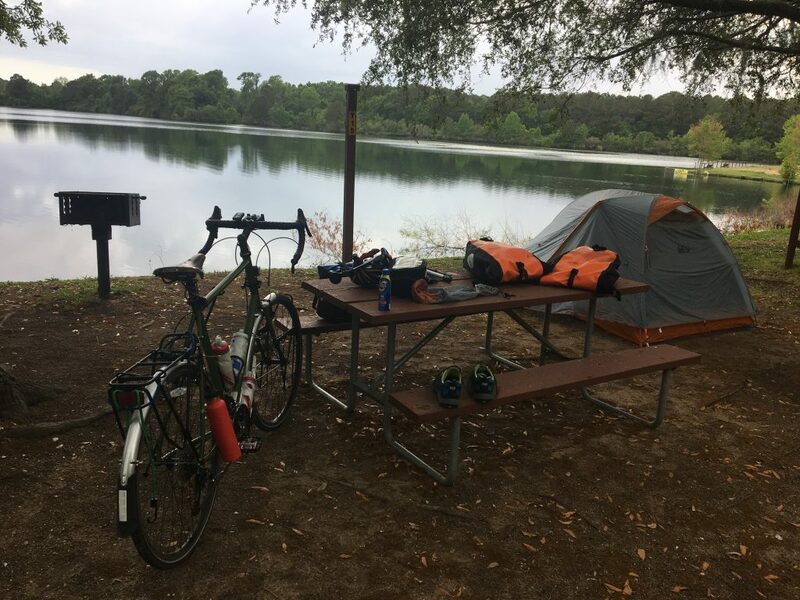 I had scoped out a free campground in the middle of the Francis Marion National forest. The US Forestry website listed the only amenity as a water pump. You can’t beat free and water is my only real requirement so I was perfectly happy with the place. 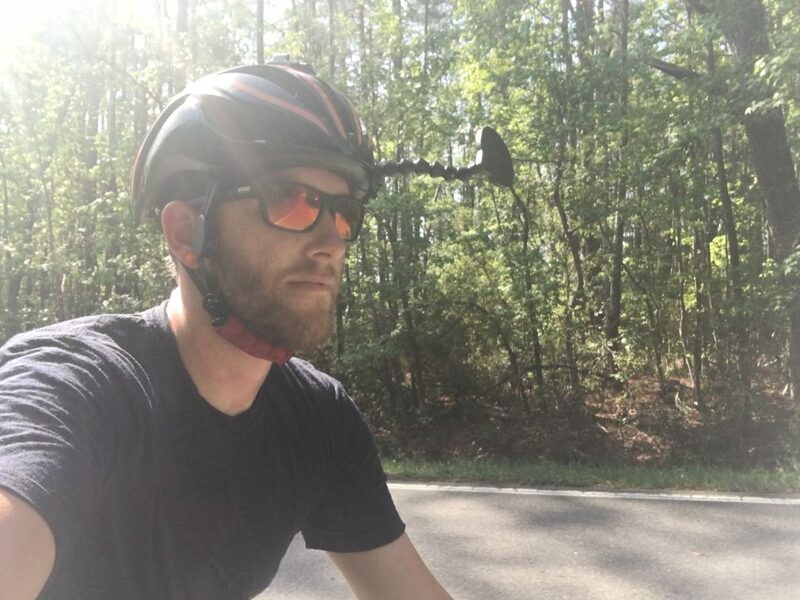 So I pedaled out into the beautiful spring morning. The weather was mostly cloudy with a chance of rain in the afternoon which sounded lovely as by the afternoon time I’m usually hot, sweaty and covered in road grime. So about an hour later I’m pedaling along down a back country road where you would expect there wouldn’t be a lot of traffic. Well that wasn’t the case at all. There were what seemed like hundreds of logging trucks barreling both directions down the road. It wasn’t really as bad as it sounded as they mostly gave me wide birth but it’s still a bit disconcerting to hear that thunderous VRROOMMMM as they pass by. On this same road I had my next encounter with man’s best friend. Or friend’s I should say. I heard a pack of pups running and barking like mad coming up on my tail. I turned around and it was this beautiful lab and 4 of her not quite full grown puppers. They looked so vicious with their little pupper tongues lolling about. I really, reallyI, wanted to stop and pet them but I didn’t want to be responsible for getting a pack of dogs smushed by one of the trucks screaming down the road. I slowed down and, in my most commanding alpha voice, said “GO HOME!”. They turned back towards their house but that look of betrayal is going to haunt my dreams tonight for sure. At the 40 mile mark I stopped at a little, run down looking store to get a snack and fill my water bottles up. I got some jerky and a gatorade and the lady asked if there was anything else I needed. I told her I’d do about anything for a pickle and lo and behold she reached under the counter and pulled out a huge, fresh jar. The One True Turtle was smiling down on me this day for sure. 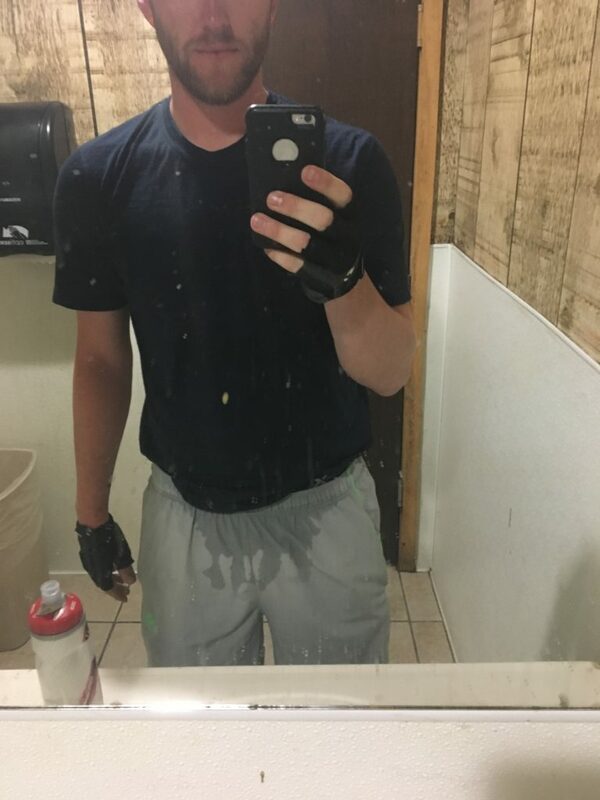 I used the bathroom outside to fill my water bottles up. The water smelled really strongly of sulphur but I drank it anyway. It was cold and wet and, really, what choice did I have? We’ll see in the next few days if I get dysentery. The next 20 miles to my camp went by smooth and fast thanks to this new podcast I found, Cashing in with T.J. Miller. If you’re a fan of his comedy then check it out, it’s hilarious. So I finally made it here no worse for wear but I’m a little off course. Still headed in a southerly direction but It’ll take some maneuvering the next few days to get back onto the Atlantic Coast Route. It’s all part of the adventure though. Stay tuned for the next edition of James and his Bike! Yo! Check out some of Joe organs podcasts. 3 hours long usually, he interview’s comedians, atheletes, physicists and survivalists. I look forward each day to reading about your adventures!!! You’re hilarious James. Michaels mom is following you now as are a couple of my Alaska peeps! This kids’ father has no sense of humor.